Developing countries are defined according to their Gross National Income (GNI) per capita per year. Countries with a per capita GNI of US$ 11,905 and less are defined as developing (specified by the World Bank, 2012) and with a per capita GNI $ 1,906 (2013)Vietnam is one of the lower middle-income countries. The country is communist and also known as The Social Republic of Vietnam. The main source of economy is agriculture and majority of the population (around 80%) do not follow any particular religion. According to the latest statistics (2013), Vietnam's total population is 92 million and 35% of this population (i.e., about 32 million) are 15 years of age or younger. Birth rate is 16.56 births/1,000 population (2013) which means that each year about 1,500,000 children are being born and the expected number of children born with CHD each year can be expected to be 15000 (1% CHD). [Figure 1]. In Vietnam, the healthcare system's organization, both public and private, is carried out on the basis of wards, districts, provinces, and cities, where the people reside. The total number of hospitals in the public system is nearly 8 times that in private system. There are a total of 20 pediatric cardiologists that too only in the hospital of bigger cities. 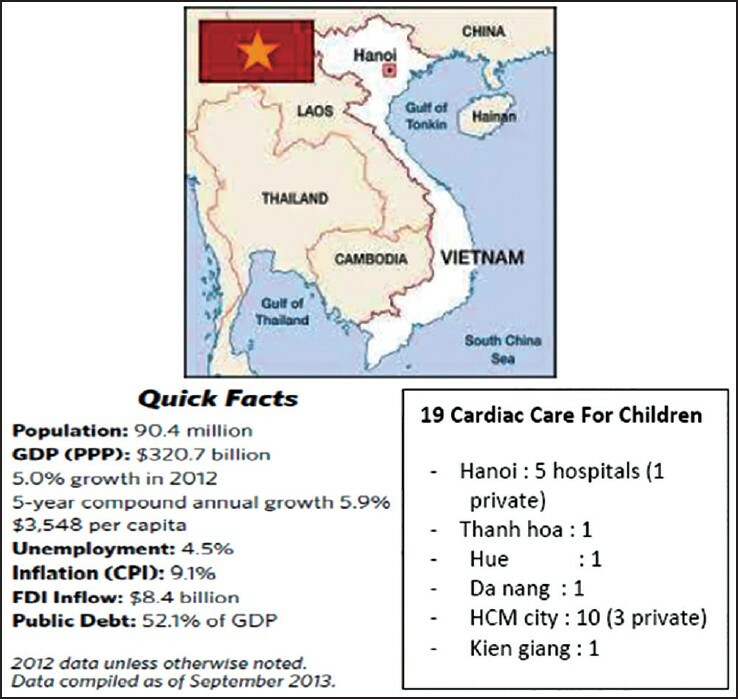 One of the unique aspects of the health care system in Vietnam is that all children under 6 years of age have health insurance coverage, under which almost all heart operations and catheter interventions are free in government hospitals. This shows the special interest of the government toward children in this country. At our center, i.e. Children's Hospital 1, cardiac intervention (both catheterization (cath) and surgery) is free for children under 6 years of age. Nineteen centers for cardiac care for children have been established throughout the country, but only five hospitals have the facility for cardiac surgery for newborn, especially for complex CHD. To name them, they are: National Pediatric Institute (Ha noi), Central Hue hospital (Hue), Children's hospital 1 (Ho Chi Minh City - HCMC), Children's hospital 2 (HCMC), and Heart Institute (HCMC). 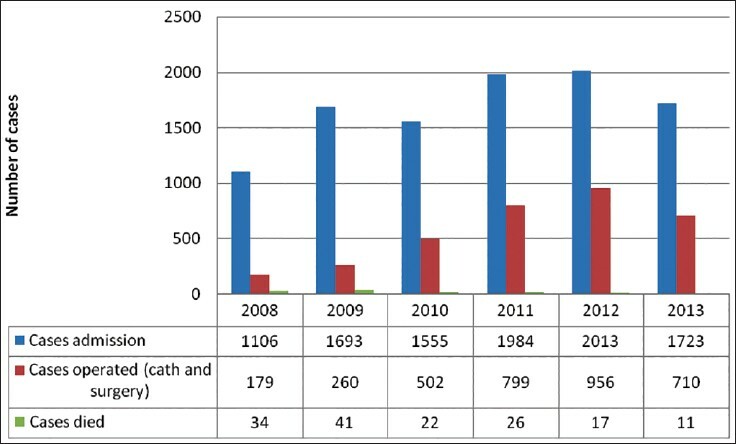 Though exact data from all these centers is not available, on an average around 5,000 patients is operated per year, and the number of cath procedures done is estimated to be much more. Almost all the centers listed above have developed well only recently, in the last 5 years (from 2008). That is precisely the reason why we still have a long waiting list for cardiac surgery unlike for catheter intervention [Figure 2]. Once the patients are diagnosed with CHD, they follow a stepwise sequence by which they are transferred from the district to provincial hospitals and then to city's hospitals. If their disease cannot be dealt with in any of these centers, they will be transferred to one of the specialized centers five centers listed above. We feel that these are the few lucky children who benefit from the timely detection of CHD, but there may still be many more who die due to undetected CHD. With the ongoing development in other countries, many charity organizations have come to Vietnam to lend a helping hand in the screening and treatment of CHD and other diseases, which is encouraging. From [Figure 2], one can see that pediatric cardiologists are available only in cities and that's why many cases of CHD especially the duct-dependent ones are diagnosed late in the course of the disease. Most of these patients come to the hospital in adverse conditions like severe hypoxia, heart failure, shock and severe pulmonary hypertension. For example, at our center, 90 patients of Total anomalous pulmonary venous return (TAPVR) were operated from 2009 to 2013 with the mean age being 5.5 months (0-35 months), which is a much later age (as far as the disease is concerned) when compared to data from other sites  where the mean age was 1.7 months. Many barriers to timely referral exist here which include, lack of pediatric cardiologists or trained pediatricians who are aware of CHD, some orthodox customs like preventing newly born babies and their mothers from exposure to sunlight, lack of adequate knowledge about CHD among the common man, lack of good communication between obstetricians and pediatricians, lack of awareness and expertise in fetal echocardiography, poor availability of echo machines and oximetry which decreases the chance of detecting CHD earlier. Though more than 80% of pregnant ladies visit their doctor at least 3 times prenatally, the number of cases of CHD diagnosed prenatally is almost nil. We have a system where doctors from other provinces visit higher centers to learn more about CHD. Once they learn, echocardiography machines are bought for usage at the district and provincial level. We face many other difficulties in the management of CHD, a major one being lack of Human Resources. We lack adequate medical personnel like nurses (Cardiac ICU, or cardiology ward), CPB technicians, cardiac anesthetists, specialists in cardiac imaging, pediatric cardiologists (we have about 50 of them), pediatric cardiac surgeons (around 20 of them and in some centers adult cardiac surgeons operate on CHD). We have inadequate equipment and facilities, we do not have enough ambulances for transferring patients, 2 hospitals have ECMO, 4 hospitals have Nitric Oxide; we are lacking in echo machines, ventilators, monitors, IV pumps, specialized beds in CVICU and PGE1which is still not available in many of the hospitals. Specialized intervention for CHD is sparingly available: Balloon atrial septostomy (BAS) and Patent ductus arteriosus (PDA) stenting (available in 4 hospitals), urgent cardiac surgery for newborn (in 5 hospitals), pediatric cardiac surgery for complicated cyanotic CHD (in 5 hospitals), Norwood procedure for HLHS (only in a single hospital). Adequate facilities for post-operative follow-up of CHD are not available in many of the hospitals. We have taken many steps to solve these issues one by one: We have started training more and more people for the cardiac team and they get trained in Vietnam and overseas, we have started collecting data systematically, started cooperating with foreign charity organizations like Children's Heartlink to support us in training for e.g. : few doctors from overseas like Dr Siram Shankar (pediatric cardiac surgeon from Singapore) would visit us and train our surgeons. Over the last 5 years, our center has improved a lot and has overcome many of these difficulties with the support of many organizations: In 2008, we began with ASD closure in those with > 10 kg body weight; and day by day we added more complex cases like Ventricular septal defect (VSD), TAPVR, transposition of great arteries (TGA), Double outlet right ventricle (DORV), Truncus, Glenn and Fontan and the child's body weight has become less importance in the current scenario. But because of the long waiting period and lack of ICU beds, we do not prefer conduit repair and single ventricular repair. Cardiac interventional treatment (cath) began in 2009. We started with one cath room which was working 5 days/week and with five interventionists working in it, we could do around 1,000 cases/year. From 2006 to 2009, many simple cases of PDA, VSD, ASD had died because of severe heart failure and severe pneumonia. At present, this number has significantly reduced owing to improved health care delivery. Simple defects like ventricular septal defects, atrial septal defects, pulmonary stenosis, and persistence of ductus arteriosus. Defects with moderate complexity like Tetralogy of Fallot, aortic stenosis, pulmonary stenosis, and ostium primum atrial septal defect, TAPVR, PAPVR, and common atrium. Complex congenital heart disease group which includes DTGA, double outlet right ventricle, tricuspid atresia, pulmonary atresia, congenitally corrected transposition of great arteries, AVSD, truncus arteriosus, other single ventricle physiology, other cyanotic congenital heart diseases [Figure 3]. Our data shows that as far as simple cases are concerned, a large of number is being done with each passing year. This group of patients is our priority but we still have a lot of VSD patients waiting though most of the PDA, ASD and PS patients are managed quickly by cath. In the group with moderate complexity, TOF is the commonest lesion in our waiting list, just because they get admitted in earlier stages of the disease and hence can wait for a longer period of time. With our limited expertise, trained personnel and infrastructure, we are trying to manage most of the cases that cannot wait longer like DTGA, TAPVR, and large VSD. That's one another reason why TOF patients are not operated upon on a larger scale on a yearly basis. Our next plan is to have a Step down ICU, one more operation room, more echo machines, and trained personnel to help carry out the management plans. Vietnam is a developing country with majority of population in the low middle-income strata. 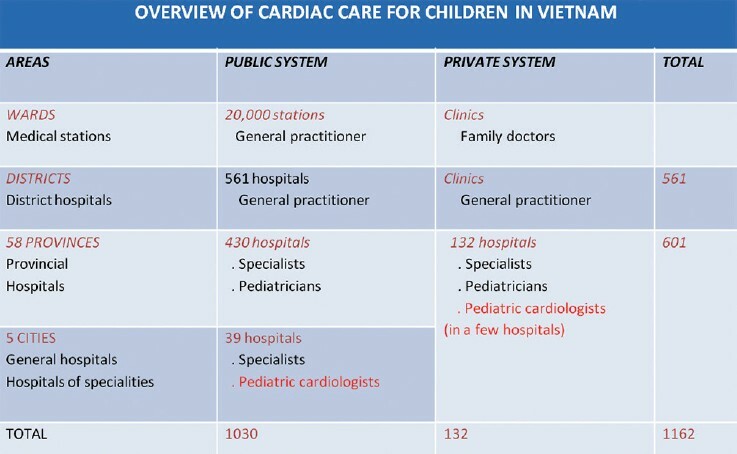 When compared to developed nations, it is a lot more challenging to deliver care for children with heart disease in Vietnam. The specific challenges in CHD are late diagnosis, inadequate infrastructure, personnel and inadequate supply of drugs. During the last 5 years, the situation has improved a lot. Data shown above is just the data of a single center, Children Hospital 1- HCM city. We are part of a department in a General Pediatric Hospital and with the growing need to address the issue of CHD; with the support of government and health care insurance for children and the help provided by many charity organizations, our cardiac team is now able to address almost all kinds of CHD. Training more doctors and other medical personnel, buying more echo machines and improving the infrastructure and associating more closely with obstetricians are some of the areas that we are trying to focus on. Hoffman JI, Kaplan S. The incidence of congenital heart disease. J Am Coll Cardiol 2002;39, 1890-900. Karamlou T, Gurofsky R, Al Sukhni E, Coles JG, Williams WG, Caldarone CA, et al. Factors associated with mortality and reoperation in 377 children with total anomalous pulmonary venous connection. Circulation 2007;115, 1591-8. Mocumbi AO, Lameira E, Yaksh A, Paul L, Ferreira MB, Sidi D. Challenges on the management of congenital heart disease in developing countries. Int J Cardiol 2011;148, 285-8.